Energic motoculteur C7 S Bloc. Energic motoculteur C7 S Bloc ready for restoration. Lubrication. By constant circulation of a gallon (4,5ltrs) of oil from a separate reserve tank. The circulation pressure being attained from crankcase compression , and controlled by a float. (see oil ball float return valve). Energic motoculteur C7 S Bloc motobecane engine. Gears. The three speed gear box is built within the engine. Reverse. All three speeds are available in reverse. The application of reverse gear lifts the plough out of the ground. This is also used for maneuvering the motoculteur. Energic motoculteur C7 ready to roll. Hitch. All implements are attached to a swinging draw bar by means of a single pin. 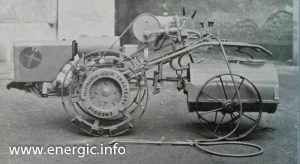 A patented devise allows the plow to work outside the motoculteurs width, maintaining the draught from the center of the motoculteur. Fuel consumption. Four hours per gallon of petrol. or 1 hour per 1 to 1,25 litres of fuel. the tank holds approx. 9 litres. 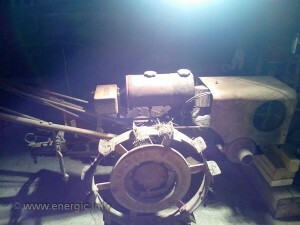 Energic motoculteur C7 with direct drive spraying lance system. 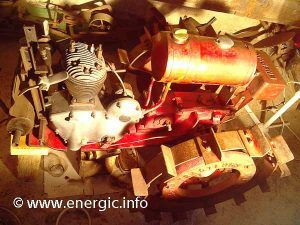 Voir restauration ici/see restoration of a Energic motoculteur C7 S bloc project Berg ici/ here. 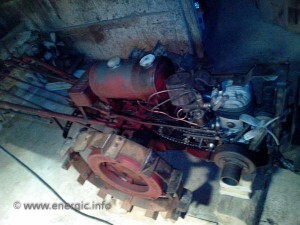 Voir restauration ici/see restoration of a Energic motoculteur C7 S bloc project Buna ici/here. 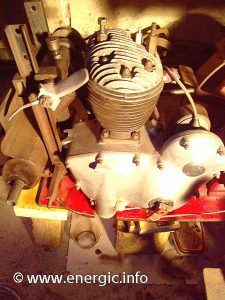 Voir restauration ici/see restoration of a Energic motoculteur C7 S bloc project Long ici/here.